An ESP-8266 Wifi-Controller together with a STM8S003 CPU for about $2 - incredible. Since the STM8S003 is almost identical to the STM8S103 used on the STM8S103 breakout boards all software runs here as well. I am not sure why the '003 is sold for half the price, or, to put it the other way around, why anybody should choose the '103 at all. Did I miss an important difference? The ESP-14 is basically an ESP-01 Wifi-module together with a STM8S breakout board combined into one PCB. The ESP part comes preprogrammed with the usual ESP AT-Firmware and is connected to the RX/TX pins of the STM8S. It feels like having a classic ATmega8-Arduino with a build-in ESP-01 module. Using the WiFiEsp library we could have a programming experience very similar to using an Arduino with a Wifi-shield or an Arduino Yun. The main problem is the limited flash space of the '003. Even the very basic WebServer example that comes with the WiFiEsp library needs more then 14kB flash and more than 1kB RAM when compiled for an Arduino Uno. Even if the library could be carefully optimized to fit into the 8kB flash of an '003 - there would be no space left for the actual user code. It is still possible to do very simple task by just sending AT-strings to the ESP. But here we are definitly leaving Ardunio territory. Here we have to start from scratch and do it all by ourself. This is not going to be beginner-friendly anymore. The major remaining advantage of the STM8S over the ESP is power efficiency. The STM8S runs on almost nothing, while the ESP draws anything between 50 and 200mA even for the simplest tasks. 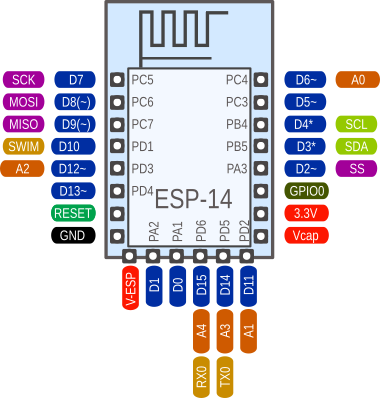 In most cases you might want to implement the external communication part of the application on the ESP, using the ESP8266 Arduino port. The STM8S is better suited to local control and measurement and other energy- and time-critical tasks. Both CPUs use separate power supply inputs. Using an additional PMOS transistor the STM8S could control the power supply for the ESP and help extending battery life by activating the big brother only when its services are actually required. Overall, the '003 is a very questionable CPU choice by AI Thinker. The '003 is clearly one of the cheapest CPUs on the market, but the applications for this module are heavily restricted the the small flash memory. Why didn't they use an ATmega328? Just one dollar more and the whole Arduino universe opens up. Or at least an STM8S005K6T6C, offering 32kB flash and 2kB RAM for only 40 cents more, if you want to go really cheap. And why would you need an external PMOS to control the ESP power supply? Why is this not included on the PCB already? This could the big killer feature of the current combination. Having a beefy 32 bit CPU and using it as an I/O-coprocessor while running the main application on an resticted 8-bitter is a weired concept. Things like the Arduino Yun or the Arduino WiFi-shield don't make too much sense. It is much more sensible to use the big CPU to control the small one than the other way around. Maybe this board can help to promote that concept.